Where: Omaha, Nebraska and other locations when possible. Who: My name is Bill Conley. I started this project on my 50th birthday and made the first gift the first week of September, 2012. Thanks for reading and I hope you enjoy the blogs. If you would like to contact me, my e-mail is giving50x52@gmail.com. I absolutely love this venture of yours! It’s going to be an amazing 52 weeks!! I look forward to following your journey :). I love your plan, Bill. Great idea. I look forward to hearing about your giving. hey how you doing chief :)))) Finally I got a chance to go through your heart touching website. Hats off for your lovely inspirational thoughts and ideas. One thing I really like to share about this country and people like you is “you guys does make a difference in a life”. I am really touched with your work and I pray for all the success and great fortune with joy full life. Looking forward meeting with you. Hi Bill! I love what you are doing and the impact you are making on society with your generosity. We hold an annual Polar Plunge to help support a local cause in raising funds and awareness. This will be our 5th annual Plunge and 3rd year supporting a local fund called the Super Coop Fund. It really does have it’s benefits in knowing you can help make a difference in someone’s life. Keep up the good work, we look forward to following your 52 weeks of giving. Bill this is just marvelous! What fun it must be to meet all of the people and hear their stories. I can clearly see how this can change a life, not just the recipient’s life, but yours also. The $50 is wonderful, however I bet the people who take the $50 feel much more from your generosity……they feel that someone cares. I’m inspired! I’m thinking of how I can do something similar. Amazing idea! What a story you have to tell! Bill, what an amazing idea. I heard about what you were doing from a Mom of one of my employees. You recently met a young lady by the name of Tiffany. You need to know that she took the $50 you gave her and bought games and art supplies and took them to the community center she works at and gave them to the children to enjoy. Your generosity has touched more lives than you may have anticipated. See week 29. Tiffany completely blew me away with her post and her use of the $50. I love this! What a great idea, I’d love to do this. Bill, Happy Birthday!!! Thank you for sharing your amazing and inspiring journey via the blog. Your time and ability to listen and desire to really know the individuals has made such a difference in the lives of others. Starting your 50’s this way, makes me curious what the 60’s and 70’s will be like. Every time I drive past the Columbus Middle School sign, I think of you. Thanks again for sharing your blog! Bill, my nephew, Matt, was your #52. He is truly a remarkable young man and an accomplished golfer. He has had 2 holes in one in his 12 year life!! He is also very humble, taught to him by his dad, my brother. He has been taught not to brag or show off. Just do the job and walk away. I am so proud of him and all he has accomplished so far and know in my heart he will go far. 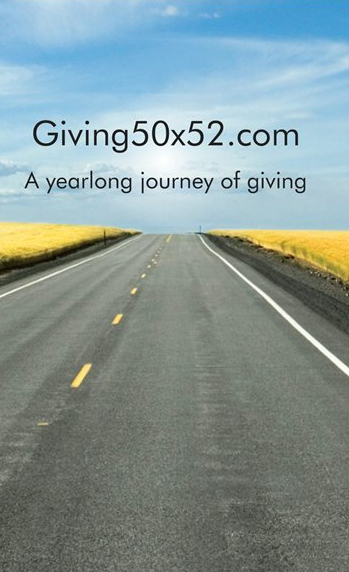 Thank you for picking him from a crowd of thousands, to honor your Give50x52. You picked a winner!!! Nan F.